A crown court judge has thrown out the case against a campaigner accused of vandalising a masterpiece by the English romantic painter John Constable. Paul Manning, 57, was due to plead to a charge of criminal damage at Southwark Crown Court. But Judge Alistair McCreath, Recorder of Westminster, quashed the indictment. He said the cost of restoring the artwork was less than the prosecution first claimed. 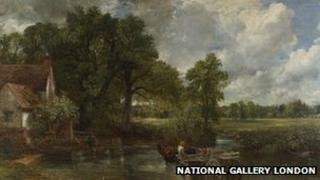 Mr Manning, a Fathers4Justice campaigner from Kirkstone Road, Sheffield, faced one count of damaging property after a four-inch (10cm) photograph of a young boy was glued to The Hay Wain at the National Gallery in London in June. Judge McCreath told the court an expert had concluded the damage had simply brought forward the painting's planned restoration, and the damage was put at £3,436 rather than the £30,000 the prosecution had originally said. He said: "I'm simply quashing the indictment. End of. "The matter must take its course elsewhere." The case will now be sent to Westminster Magistrates' Court.